Did you know that you could purchase Instagram followers for just a couple of bucks? Social networks are aware of this new phenomenon, and they are clamping down on this questionable practice because some believe it deceives fans. The media spotlight is once again shining on the purchasing of fake followers. Recently, social media giant Instagram reported that it would be eliminating all spammy accounts. The photo-sharing website isn't the only social media platform plagued with fake accounts. Its microblogging competitor Twitter has had its own problems with the infiltration of fake followers. Instagram has already started to deactivate and permanently remove these accounts. This move will certainly affect accounts that rely on fake users, such as bloggers, politicians, and celebrities. Whether intentionally or not, public figures have fake followers. During the 2012 election campaign, former Republican presidential candidate Mitt Romney suddenly had a surge of 116,000 followers in one day. Of course, it may seem trivial to the average person. Why would someone buy fake followers on any social media outlet? But this "follower economy" is in fact big business. A company that offers this service can charge anywhere from $5 per 1000 followers to $5 per 100 followers. For instance, according to the owner of YTView.com, some clients and agencies spend more than $10,000 per month to buy Instagram followers and likes. Although the firm declined to reveal clients' names, it did note that several large companies and a few big-name artists and musicians are part of its clientele. 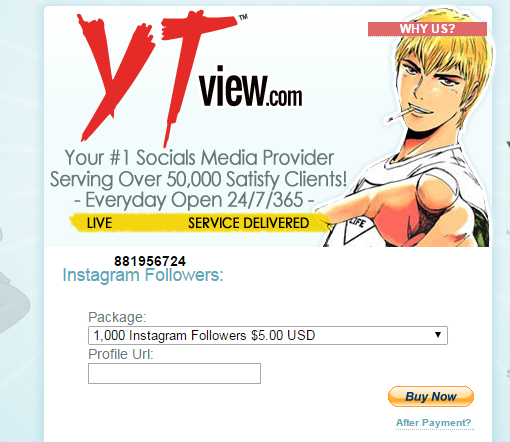 YTView.com maintains more than 50,000 customers. What do customers receive with such a service? Well, to sum it up: just a number. In actuality, these followers won't be reposting any of the user's content, initiating a conversation, or favoriting tweets and posts. All it does is show an immense following. To the public, the account will appear to be popular, which is good enough for interested buyers. The social media industry has become oversaturated in the last few years. Facebook has one billion users, while Twitter has more than 284 million. Therefore, to get noticed in a short period of time, small- and medium-sized businesses and startups take advantage of these services. Moreover, successful personalities with a large fan base can make large sums of money for endorsing products, liking brands, or retweeting comments. This generates a tremendous amount of pressure for Internet celebrities to garner a massive following to experience this same level of success. Brands and personalities will likely never concede to acquiring social media followers. However, after investigating several accounts, experts say some patterns and trends exist. "If you look at the fake accounts, their followers, and who they're following, some patterns emerge. Most of the fake accounts tend to follow thousands of people and don't have many followers themselves," stated former The Verge reporter Adrianne Jeffries. Jeffries continues by saying, "A subset of the accounts they are following have more than 10,000, and sometimes 100,000 followers. These larger accounts, like this one for @nfengphoto, are probably the ones buying fake followers." In the end, the issue of purchasing a social media following isn't exactly problematic and may not be any of our biggest concerns as a society. However, it may prompt the public to ask: is this Instagram account's following organic or was it simply bought? Image courtesy of YTView.com's website.